Just concluded another Forex course. No losses once again. Account up 93% in nine months! Just concluded another weekly online Forex trading course and continued the nine-month-long streak of zero losses and the account is now up 93%. It's all Market Composition + MMT + Mental Game. If you don't believe, read the comments of my students. I'd be happy to give you referrals. They're putting what they've learned to practice and already making money. Next Forex class is March 10-14. We're supposed to celebrate this? The good news, though, is that it's mostly due to rising revenue rather than spending cuts. Yves Smith — Vermont Citizens Push to Form a State Bank, But Will Ratings Agencies Kill the Idea? The rating agencies as "enforcers" of neoliberalism, and about as subtle as a Mafia enforcer. Winterspeak addresses some of Ramanan's observations. A point of clarification. Winterspeak says, "One of the more interesting MMT insights, as stated by Mosler, is "exports are a cost, imports are a benefit", which is the opposite of the usual narrative where export driven economies, like Japan, are hailed while import driven economies, like the US, are said to be more vulnerable." What Warren and MMT economists say is that ""exports are a REAL cost, imports are a REAL benefit," implying a monetary system in which an independent currency ("sovereign" currency) is neither a real good nor backed by a promise of the issuer to exchange it for anything real. I don't believe that is controversial in economics. The notion that n export-driven economic is superior to an import-driven one is a holdover from the metal standard, e.g., where international trade was settled in gold or silver and the wealth of a nation was measured by its stock of precious metal. That's the mercantilist position. While it is over, the same thinking persists, some would say irrationally. Now, the rational position is to prefer an advantage in real terms if it is possible to achieve, since national prosperity is measured in consumption rather than either financial claims or gold stock. On matter related to trade that often doesn't enter the discussion in economics is relative power. Power has been demonstrated in the extreme historically in imperialism and colonialism, and the slave trade, for instance. However even in contemporary, and supposedly, post-imperial and post-colonial times, power imbalance also results in economic and financial imbalance in trade, and usually this is in favor of the more powerful nation in the trade relationship. Neoliberalism tries to co-opt "freedom." More neoliberal propaganda. I guess Conant and Becker don't travel much and haven't seen vast tracts of clear cutting in the West, or mountain top removal in Appalachia, or polluted rivers, lakes and streams, or ...... Surprising that eminent economists have never heard of negative externality, also known as capitalize the upside and socialize the downside. What a crock. It insults the intelligence. This is convincing that letting the central bank set the interest rate is insane. Reading the Fed minutes with hindsight, these people had no clue and were paralyzed for action in the face of an emergency. It makes a good case for the soundness of Hayek's The Uses of Knowledge in Society. Lord Turner, who is the former head of the United Kingdom Financial Services Authority and currently a Senior Fellow at the Institute for New Economic Thinking, pointed to continually rising levels of private debt as a key culprit holding back the recovery of the global economy. Why aren't all the inflation nuts screaming, "money printing, hyperinflation?" What's the problem? Departmentalization of knowledge and learning, resulting in loss of holism and context. Here’s this blog’s takeaway: It’s impossible to understand a dynamic, systemically integrated world using a static, fragmented curriculum. But Yanukovych sought to maintain cordial relations with neighboring Russia, which apparently rubbed American neocons the wrong way. In other words, this is a fragile system. Worse, the current regulatory treatment of derivatives and of funding for large complex financial institutions – the global megabanks – exacerbates this fragility. One of the puzzles about the financial crisis of 2008 is why the regulators were so slow to recognize the impending collapse of the financial system. In this, paper, we propose a novel account of what happened. We analyze the meeting transcripts of the Federal Reserve’s main decision-making body, the Federal Open Market Committee (FOMC), to show that they had surprisingly little recognition that there was a serious financial crisis brewing as late as December 2007. This lack of awareness was a function of the inability of the FOMC to connect the unfolding events into a narrative reflecting the links between the housing market, the subprime mortgage market, and the financial instruments being used to package the mortgages into securities. We use the idea of sensemaking to explain how this happened. The Fed’s main analytic framework for making sense of the economy, macroeconomic theory, made it difficult for them to connect the disparate events that comprised the financial crisis into a coherent whole. We use topic modeling to analyze transcripts of FOMC meetings held between 2000 and 2007, demonstrating that the framework provided by macroeconomics dominated FOMC conversations throughout this period. The topic models also show that each of the issues involved in the crisis remained a separate discussion and were never connected together. A close reading of the texts supports this argument. We conclude with implications for future such crises and for thinking about culture and sensemaking more generally. Of course, Libertarianism of the right and libertarianism of the left have a lot in common in that they both value freedom. Freedom entails rights, and rights entail responsibility. The disagree is over prioritizing rights and responsibilities. Libertarianism of the right accords the right to security of person and property much greater weight than does libertarianism of the left, which views human and civil rights as having the highest priority. Libertarianism of the right emphasizes individual independence, whereas libertarianism of the left emphasizes balancing individual independence, equality of persons, and interdependence. This post shows how a land tax works, based on the work of Henry George. Michael Hudson has been pounding on this forever, too. Tax economic rents, not productive contributions. Doh. Warren Mosler has said that in his view a land tax would be sufficient to control inflation using functional finance. Taxes do not fund government. Michael Hudson would also tax away monopoly, oligopoly and monopsony rents, as well as financial rents, too, in order to discourage them, since they disrupt markets and lead to social dissonance. Generally such rents can only be collected with either favor government policy, often from capture of the political process, or at least government inaction to preserve a level playing field. The hidden agenda of neoclassical economics from the get-go was to exclude economic rent from consideration after it had been featured in classical economics. This has been a roaring success and any attempt to address economic rent is now denounced as anti-free market, socialism, class warfare, and Marxism. So most economists, even heterodox economists other than Marxists and Marxians avoid mentioning economic rent, just as they avoid mentioning class structure and power structure. All these go hand it hand. Rumplestatskin provides a very simple explanation of how conflating land and capital as "capital," as neoclasssical models do, obscures the role of land rent. For example, when we whittle our way through the production chain down to the landowner, who has one input, land, the neoclassical framing say that this owner rents their land inputs, which are compensated at their marginal contribution to production. Okay. So she rents off another person who owns the land, who we then model as renting from another person, and so on. That’s what happens when you conflate land and capital into a single input. They nee[d] to be treated differently because land is not an output of any production process, unlike capital. When you allow the buck to stop at ownership of land and natural resources, you get a very different picture of the economy. One in which the taxation capacity of rents is not limited their current value. As Gaffney points out, when we “lower other taxes, the revenue base is not lost, but shifted to land rents and values, which can then yield more taxes”. From Thomas Piketty's book. There is no net public debt (public investment less public debt). Is Liz positioning herself for something? Longish but thoroughly enjoyable. "Methodological arrogance." I love it. No, the debate over economic method is not over in spite of how loudly the mainstream screams it is. There is no effective way to regulate or prohibit shadow banking other than at the margin. The only effective option is to let the financial system collapse, nationalizing the insolvent firms as the US did in the case of General Motors and providing the needed fiscal support to the real economy to keep it from being affected by low demand. There is no substitute for liquidation in capitalism, and governments have the power to let insolvent firms go under if it steps in and makes up the shortfall during any sort-out period, while nationalizing those firms that are too big to fail. They can be sold off to new equity holders after the crisis has passed and new management can take the reins. The US did that with GM, and it should have done it with financial institutions that were also insolvent, cramming debt down to equity and assuming the equity of the former equity holders. This was not an off the cuff remark by Harry Reid, the consummate politician. Either the Koch Bros. are hurting Democrats, or the Democratic Party sees political capital in going after them. The GOP has been attacking the Democrats as un-American and worse for some time. The Democrats have resisted taking the gloves off and responding in kind. Looks like that may be changing. This is huge! It completely shifts the focus of national security. America is now back in the position of having to arm to fight on two major war fronts simultaneously, as the US faces off with Russia over its buffer zone and now China as well. A new Cold War is heating up. I rarely disagree with Turley, but here I think that Chief Judge Alex Kozinski got it right in writing the opinion. The right to free speech has to be balanced against misrepresentation that is damaging. There is no right of free speech to damage others through misrepresentation anymore that free speech covers yell "Fire!" in a crowded place with limited egress, and I don't understand how Professor Turley thinks otherwise. Liberalism is not "anything goes." Tucker Carlson uses the F word (fascism) on Fox Noise. OK, now it's on the table. Let's tear and compare. Paul Ryan doesn't make the cut. Rand Paul, Marco Rubio, Jeb Bush and Ted Cruz are in the lead. I would say that if Jeb Bush wants it, the money will be behind him. This would like be a Bush-Clinton race as things now stand. Robert Oak — Oh Those Credit Suisse! I can't believe that this trumped-up charge is being taken seriously by the prosecutor. Apparently, the court may agree. Hopefully, this will eventually result in dismissal, followed by a successful suit against the city for damages. It's too bad that the buck doesn't stop at the top so that the major and police commissar at the time could be sued personally. By the way, is fascism even a crime in the US or the state of New York? Merijn Knibbe — A 1963 critique of neoclassical econmics. Did anything change? No. The position hardened as neoclassical economists doubled down. A 1963 critique of neoclassical econmics. Did anything change? The following is reproduced from "An Essay on Post-Keynesian Theory: A New Paradigm in Economics", Al Eichner and Jan Kregel's 1975 Journal of Economic Literature article. Of course, the table being a summary, all entries are highly stylized. As I explained to students, all economic theories—for example, neoclassical, Keynesian, and Marxian theories—represent moral economies. And they arrive at very different conclusions concerning the justice or fairness of capitalism. Thus, for example, neoclassical economists argue that everyone gets what they deserve and, through the workings of the invisible hand, the result will be full employment. In contrast, Keynesian economics is based on the proposition that, while everyone may get what they deserve (with the possible exception of coupon-clippers), it’s quite possible that will result in less-then-full-employment equilibrium, which then requires the visible hand of government intervention. Marxian economists propose a third possibility: even if everyone gets what they deserve in markets, in production things are different (because of exploitation)—and the consequence, whether there’s an invisible or visible hand, is inequality and instability. In other words, the three economic theories represent radically different moral economies. These three major theories are not exhaustive of possible explanations and other theories are possible, such as proposed by institutionalists who hold that social, political and economic outcomes result from cultural convention and institutional arrangements reflective of the imposition of a class and power structure, but differently from Marx. Such theories, which are a combination of life science, social science and economics, are capable of explaining not only capitalism but other social, political and economic systems and their consequences historically as Marx sought to do. But they do it differently on the whole, even though they may make use of some of Marx's insights. Marxian economics also uses this type of analysis but it is not the only approach that does, even though neoliberals generally tar anyone who does so with the Marxist label. By the way, Marxian economics different from the Marxist variety, in that Marxism is an ideological approach that generally claims faithfulness to Marx, while Marxians interpret insights of Marx contemporaneously. Ruccio also brings up the point of flawed individuals versus flawed institutions. In my view this a a blurred distinction, since flaws individuals create flawed institutions and also maintain them at least implicitly by participating in them, rather than flawed institutions just happening with good people being caught up in them innocently. So much for invoking "Say's law" against fiscal stimulus to offset demand leakage and unemployment. He anticipated Keynes's criticism of changing propensity to save versus propensity to consume and recognized the potential for short-run supply gluts. Like Adam Smith and David Ricardo, Jean-Baptiste Say was pressed into neoliberal service. This week on Moyers & Company, López, author of the newly released book, Dog Whistle Politics: How Coded Racial Appeals Have Reinvented Racism and Wrecked the Middle Class, joins Bill to talk about how racism has changed in America since the civil rights era. The dog whistle of racism, says López, is “the dark magic” by which middle-class voters have been seduced to vote against their own economic interests. Politicians have mastered the use of dog whistles – code words that turn Americans against each other while turning America over to plutocrats. But that overlooks the real hurdle in all this: German public opinion. Not only is the constitutional court one of the two holy institutions in Germany, the other being, of course, the Bundesbank. German public opinion is firmly imprisoned by the failure of Germany’s political leadership to explain to the German public that Germany itself has played a key role in causing the unresolved euro crisis. Germans firmly believe that their country is the ‘Musterknabe’ of the euro and that all would be well in the land of the euro if only everyone else became just like Germany – when nothing could be further from the truth. Germany’s apparent success under the euro depended on others behaving differently. Forcing everyone to behave just like Germany is making matters worse today. Alas, this is not an appealing insight in a country of citizens sharing the belief that all countries of the world can become more competitive at the same time, with “competitiveness in stability” being the German holy grail; just as having all countries simultaneously run persistent current account surpluses is held possible, according to German math and accounting rules. Nor has anyone enlightened the German public about the catastrophic consequences for Germany itself in case of euro breakup. As a result, Germans may be easily fooled by the fantasy of a “Gexit without pain” – which appears to be the promise held out by Germany’s growing anti-euro brotherhood. For a start, then, try to educate the German public that quantitative easing is not a synonym for hyperinflation and euro bonds not a transfer union in disguise. Someone should also explain to the German public why "the German solution" has depended on wage suppression for decades in order to run an export economy without wage inflation. Pally lays out the alternatives. The big analytical difference between Foster and Magdoff and myself is that they see stagnation as inherent to capitalism whereas I see it as the product of neoliberal economic policy. Foster and Magdoff partake of the Baran-Sweezy [monopoly capital] tradition that recommends deeper socialist transformation. I use a structural Keynesian framework that recommends reconstructing the income and demand generation mechanism via policies that include rebuilding worker bargaining power, reforming globalization, and reining in corporations and financial markets. These views are not mutually exclusive, but in the end, reforming capitalism leads to a dead-end. It's possible to reform capitalism away from the neoliberal variety, but in the end, capitalism will be capitalism, that is, biased toward increasing capital share over labor share, saving and investment over worker income and consumption, therefore, supply over demand. Having superior power and the ability to capture governments, capital is destined to win over labor unless workers assert themselves against this institutional structure and are able to win. This is about power. Capitalism involves a demand problem structurally through its very definition, privileging capital over labor, asset value over worker incomes, and production over consumption. This is only going to increase with globalization and labor fungibility as we enter the global age, as well as the growing introduction of automation and robotics as we enter the digital age. This is a one-two punch delivered to the chin of incomes and demand. Or, a sucker punch to the workers of the world. The result is chronic oversupply and lagging effective demand unless the entire view of political economy is revisited and revised from the bottom up, putting people first instead of machines and money. The Post Keynesianism that Palley prescribes is only punting, although it would relieve the pressure for awhile. Larry Summers’ story of serial bubbles delaying stagnation has substantial similarities with both accounts but he avoids blaming either capitalism or neoliberalism. That is hardly surprising as Summers has been a chief architect of the neoliberal system and remains committed to it, though he now wants to soften its impact. This is the typical capitalist strategy of co-optation — give only as much as absolutely necessary to keep the system in place as it is while keeping it going. It's keeping the goose that lays the golden egg on life-support. Geoffrey Ingham — Whose money is it? Geoffrey Ingham is the author of The Nature of Money. The new religion — science. Same as the old religion when used normatively and prescriptively. However, to the degree that C. P. Snow is right about the two cultures, science and the humanities, quite a few people read in the humanities rather than science and come to opposite conclusions. I was one of the latter. One path leads to materialism and reductionism and the other to humanism and holism. There is no barrier to their integration, however, other than rigid thinking. Thom Hartmann — Is It Time for a New Church Committee? Between 1975 and 1976, the Church Committee published fourteen reports on intelligence gathering abuses by U.S. intelligence agencies. In August of 1975, the Church Committee released its findings. Senator Church went on NBC's Meet the Press after the findings were released, and said that, "In the need to develop a capacity to know what potential enemies are doing, the United States government has perfected a technological capability that enables us to monitor the messages that go through the air. Now, that is necessary and important to the United States as we look abroad at enemies or potential enemies. We must know, at the same time, that capability at any time could be turned around on the American people, and no American would have any privacy left such is the capability to monitor everything—telephone conversations, telegrams, it doesn't matter. There would be no place to hide." Church added that, "I don't want to see this country ever go across the bridge. I know the capacity that is there to make tyranny total in America, and we must see to it that this agency and all agencies that possess this technology operate within the law and under proper supervision so that we never cross over that abyss. That is the abyss from which there is no return." Is It Time for a New Church Committee? What is the precise connection between human surveillance, the collection of different forms of data and metadata, and a system of corporate capitalism? Many have argued that the increasing push to collect private information or metadata is for the sake of our national security, and only secondarily, about commercial interests. However, this line of argument would be much more persuasive if the boundary between government and corporate interests were clear and unambiguous. It is not. In fact, as corporate capitalism becomes globalized, the distinction between government power and corporate power is all but erased. It is crucial to understand here that the free-trade zone of individual privacy is not merely the creation of a new capitalist commodity or the realization of an untapped potential for profit. At the human level of lived experience, the eradication of privacy also creates a widespread sense of impotence, powerlessness and apathy before powerful governmental institutions and corporate hegemonies. This state of affairs will be pivotally important in the furtherance of rampant capitalist exploitation. Why? Precisely because eradicating the private sphere is also extinguishing the possibility that individuals can act in concert to resist what is happening to them. The truth is that we discover and sustain our sense of solidarity and commonality with others when we grasp that we are unique and irreplaceable beings who need to relate to ourselves and to each other in both a private and a public way. The condition of possibility for individual reflection, for community, for acting in concert, is that the distinction between the private and the public remains inviolable. The corporate capitalist system has achieved its singular totalitarian purpose when it is able to violate the inviolable. Why this is one very, very, very, scary chart! 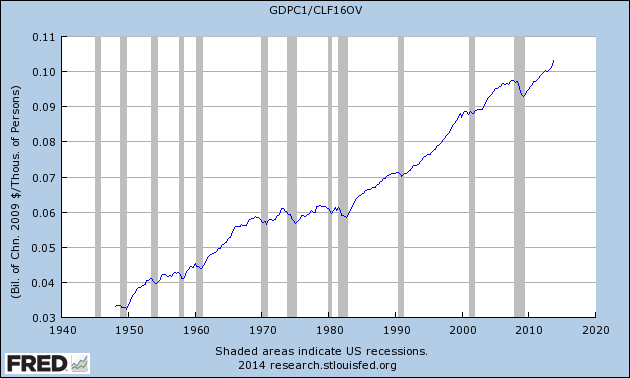 This is a chart of real GDP (total output of goods and services) divided by the Civilian Labor Force. We know that the labor force has been declining and is at, like, a 40 year low. Despite that, however, the output of our economy has never been higher. What this implies is that fewer and fewer people are reaping or participating in the wealth thrown off by our economy. Soon we will have robots doing most of the work. And then what? On the one hand you will have even greater efficiencies (robots don't tire, need to be paid, take vacations, etc) and, therefore, even more wealth being produced. On the other hand you will have lots and lots less people reaping the benefits. So, are they left to starve? Live in the streets? Go without medical care? Walk around naked, without transportation, electricity, heat? This is not just a looming crisis for the United States, it's a looming crisis for mankind. The only way to avoid this is for people to be guaranteed minimum levels of income with which to consume some of this output. Otherwise, there will be human misery and chaos everywhere. The world will look like Mel Gibson's post apocolyptic movie, Mad Max. Note: I am making a correction to this post. Pimco did not have a "terrible year." According to the firm it beat its index so one could say it simply had a bad year relative to past performance. In addition, the firm claims that outflows were due to "rotation." The main point of my post, however, is that Gross fundamentally misunderstood the fact that the funds to buy Treasuries come from government spending itself and he continues to mischaracterize the United States as a household that can run out of money. I have extended an open invitation to Bill Gross to discuss these topics on my show that I do at the NYSE for Hard Assets Investor or, right here on Mike Norman Economics. I've said for a long time that Bill Gross doesn't know what he is talking about. We've cited examples on this blog, like the now-infamous, "Who's gonna buy them now" comment that Gross tweeted back in 2011. With that comment the "Bond King" displayed to the world that he had no understanding of sovereign fiat money systems. Gross went on to have a bad year relative to his past performance and we also predicted large capital outflows from his fund and that's exactly what happened. And Gross wasn't the only one on the receiving end of our scorn. There was Mohammed El-Erian, the Pimco CEO and former IMF economist who spoke in riddles when it came to the economy, perhaps to hide his own ignorance. Now there's a story out today in the Wall Street Journal about an epic internal clash between these two behemoths. To me it seems like a battle between two partners who basically ran their firm into the ground (maybe that's too harsh) or, we can say at least, damaged its Tiffany reputation. Pretty uncivil if you ask me. And don't forget, this is a "white shoe" Wall Street firm. Anyone who's ever worked at a top of the line, white shoe, Wall Street firm, knows that discussions, conversations, indeed, even arguments, are all conducted in the most civil, low volume, non-confrontational manner that you can possibly imagine. You're NEVER going to see two co-CEOs out there trying to tear each other down in front of the hired help. If daggers are to be thrown they get thrown quietly, usually behind backs, but never EVER out in front for all to see. That's what makes this confrontation so amazing. They were really going off the rails. I've long said that ever since Paul McCulley left Pimco in 2010 that was teh end of their dominance. McCulley was not only Pimco's brilliant and ecclectic chief economist, but he was also an MMT adherent. You can't say that about Gross. I remember back in 2003, when I had Gross on my radio show, he brought up his now very well known, but incorrect, anaolgy of the United States as a household. When I asked him how he did not recognize the distinction between a currency user, like a household and a sovereign government that is a currency issuer he seemed baffled and even bothered by the question. He said to me, "At the end of the day, they're really the same." That's the thing, Bill. They're not. They're just not. Video below from the "Electric Universe" people commenting on some recent empirical findings of NASA deep space missions. Looks like another orthodox school within the contemporary academe is under going exposure as a dogma-factory, here the academe of astro-physics. NASA's IBEX and Voyager 1 missions have shattered all conventional ideas about the heliospheric boundary, the region separating our solar system from interstellar space. In 2009, the IBEX spacecraft created the first all-sky map of the boundary revealing an astonishing ribbon of energetic neutral atoms. According to scientists, it's still a big mystery. will not produce enough returns! Zero Hedge — The Conspiracy Theory Is True: Agents Infiltrate Websites Intending To "Manipulate, Deceive, And Destroy Reputations"
Glenn Greenwald report. Creepy people and sick stuff. Fascistic if as reported. Pope Francis on Monday revolutionized the Vatican's scandal-plagued finances, inviting outside experts into a world often seen as murky and secretive and saying the church must use its wealth to help the poor. Francis, elected nearly a year ago with a mandate for reform, used a document known as a Motu Proprio - Latin for "by his own initiative" - to implement immediate changes including appointing an auditor-general. The document says the Church must see its possessions and financial assets in the "light of its mission to evangelize, with particular concern for the most needy". The National Republican Congressional Committee (NRCC) has taken an odd course in the Florida special election to replace Republican Rep. Bill Young after his death in October of last year: The NRCC is bashing Democratic candidate Alex Sink for supporting Simpson-Bowles, a deficit reduction plan Republicans most often attack President Obama for abandoning or ignoring. "Alex Sink supports a plan that raises the retirement age for Social Security recipients, raises Social Security taxes and cuts Medicare, all while making it harder for Pinellas seniors to keep their doctors that they know and love," Katie Prill, a spokeswoman for the NRCC said, according to the Sunshine State News. "Sending Alex Sink to Washington guarantees that seniors right here in Pinellas County are in jeopardy of losing the Social Security and Medicare benefits that they have earned and deserve." Psychoanalyzing the economists to account for their fetish over models that don't work because the assumptions are unrealistic. Alert — Freedom of the press under attack? Bizarre. Much more to the story than the headline implies. Transcript of Amy Goodman's interview of The Guardian's Luke Harding. 'The Paragraph Began to Self-Delete': Did NSA Hack Snowden Biographer's Computer? The underlying problem is not economic per se but actually political, resulting from capture on a vast scale by an elite determined to carve the pie in its favor. This involves institutional capture, intellectual capture, regulatory capture, and even state capture. Unemployment, boom-bust cycles, imperfect competition, and the rest of the pimples on the face of neoclassical economic theory in its application, including contemporary mainstream so-called Keynesianism, result from not only flawed theory but also neoliberal policies that are rationalized by academia in the pay of the elite to dupe the rubes and deliver the goods to the top. The essences of neoliberal "capitalism" is crony capitalism, and its political counterpart is the corporate state masquerading as the market state. Just as the excess of socialism is totalitarian communism; so too, the excess of capitalism is totalitarian fascism. Many researchers do in fact note that decreasing labour share, and therefore increasing capital share, of national income has been a global trend since the 1970s. What few say however is that this is trend is a result of policy choices informed by neoliberal ideology. We certainly could have avoided this trend if we desired. It was simply a matter of different policy choices. And to reverse the trend is also very simple, should be desire to do so. In a mere technical sense, reversing the trend couldn’t be easier. Off hand I can think of dozens of policies; from inheritance taxes, greater public transparency of personal income data (including trusts), land taxes, improving the power of shareholders in the determination of executive pay, grants of land or capital for public service, and more. The options are limitless. The barrier to change is modern realpolitik. Those at the top have captured the political process, partly by capturing the media. Any change will entail a massive redistribution of wealth from those who bankroll the political parties, to those with the least resources, the least education and the least interest. Randy agrees with Brian and Neil. As usual Neil sums it up pithily. However, in the EZ the exporting countries apparently haven't clued into this obvious fact yet and are killing the geese that lay the gold eggs for their economies by forcing austerity on the periphery and reducing their own exports as the periphery cannot afford them and also seeks to increase its own exports. Yes, Germany, we're talking about you in particular. This article provides more depth to some comments I made in"MMT and Constraints". I explain why developed countries should allow their currencies to float, which is the policy stance advocated by Modern Monetary Theory (MMT). It is probably a good idea for developing countries to float their currencies as well, but they face inherently difficult policy problems that I do not know enough about to comment on. The implication of advocating a free-floating currency is that I do not see the "external constraint" as being a serious issue, or at least an issue that policy makers can hope to do anything useful about. In that previous article, I made some quick comments in response to an assertion by Thomas Palley that the "foreign exchange market constraint" is very important for countries other than the United States. Since he did not explain that assertion, I was unable to offer a very detailed criticism. My response was too short, and drew some comments. I expand my explanation here. I will first explain why I do not think that there is a significant external behavioural constraint on policy makers; but an accounting constraint obviously exists. I will also note that what I am writing is my opinion, and does not necessarily reflect the views of the economists who developed MMT. I think that poorer countries face some difficulties with free-floating currencies, a view with which they may not agree. The UK's Institution of Mechanical Engineers (IMechE) blames the "staggering" new figures in its analysis on unnecessarily strict sell-by dates, buy-one-get-one free and Western consumer demand for cosmetically perfect food, along with "poor engineering and agricultural practices", inadequate infrastructure and poor storage facilities. So much for efficiency of markets. Add this to chronic unemployment and boom-bust cycles. My Forex course starts tomorrow, but there is still time to sign up. Learn how to trade the currency markets. The course has not had a single loss in nine months. The account is up 90%. I will teach you how to replicate these results using my proprietary, *Market Composition* + MMT + Mental Game methodology. This is the only APPLIED MMT COURSE anywhere. It's great to talk and theorize about MMT, but why not learn how to use it to make money? The is an online course. Monday - Friday (Feb 24-28), 8am to 4pm NY time. Taught on the Webex system. All sessions are recorded and you can download them to review at your leisure. Live trading. Course fee is USD $2995. **If you enroll you are entitled to participate in any future courses free of charge for as many times as you want. To enroll, please go click below. Labels: foreign currency trading, Forex course, learn to trade currencies, Mike Norman Forex, trade currencies like a pro. Nice find. Gareth is putting together a history of the JG/ELR and is looking for input, both from the history of economics (theoretical) and economic history (actual programs). Ukrainians shed blood to liberate themselves. Now they want to join the EU? A tragedy on top of a tragedy. The courageous people of Ukraine overthrew a dictator. Many paid with their lives. Now what? Well, if it's up to Yulia Tymoshenko, the former Prime Minister who had been jailed by the Yanukovych regime, Ukraine is going to join the European Union. And if she gets her way it will be a tragedy upon a tragedy. EU membership has been a disaster for Greece, Spain, Portugal, Ireland, Italy, Latvia and others, even those waiting on line to join. It's one thing to give your life for sovereignty, freedom and self-determination. It's quite another to throw it all away for a different type of tyranny. The blow-by-blow of the grassroots v. the astroturf. Why climate change will lead to massive social unrest and conflict. Ray Kurzweil is given all the resources of Google to play with. AI, the Singularity, and other stuff. Something's going to come out of it, and Google is betting it is going to make a boatload of money. But what is pretty clear is that with AI likely not far off, money will not be needed to run a primitive distribution system like a monetary economy in a superabundant and omniscient environment. The history of debt is a vast and consequential topic that remains understudied. So there is no way this book could live up to its title. Much work remains to be done before anyone could produce a satisfying summary of debt history in 400 pages, if that will ever be possible. Graeber’s book is however a remarkably original achievement, and even the hubric title is well chosen. The ultimate value of this work depends on its reception, and whether it becomes a departure for further critiques and research. Hopefully this book will someday be re-written in several volumes, but this is a good start for now. Many interesting comparisons and a good summary of the history and consequences of metallic versus credit money. The review also illustrates the contrast between the breadth of undertaking and of view of anthropologists and sociologists, and the narrow undertaking and view of conventional economics. Where we are now. This is not over. Nothing really new revealed here, but it's gathered in one place. What Lofgren calls the "deep state," I would call the fascist state, or the totalitarian state, which is a combination of a corporate state, a national security-surveillance-police state, and extra-constitutional government. It's here, folks. Big time. "Government of the people, by the people, and for the people" is an American myth. "We would rather reduce our growth rate a bit in order to protect the environment and never seek short-term economic development at the expense of the environment. We should never pursue a 'pollution first, treatment later' approach. " But Big Oil Exec Rex Tillerson is fine with hydrofracking when it adversely affects others. That crown is not just ceremonial. The current situation is precarious for "captialists" v. "workers" in Marxist terms since it is crucial for the haute bourgeoisie that is, the rentiers, capitalists and top managers, to keep the petite bourgeoisie, or small business people, with them rather than the petite bourgeoise allying with the proletariat, that is, those selling their labor as opposed to those selling the product of others' labor. While this is a somewhat dated point of view today, since conditions have changed considerably since Marx was writing, there are parallels that Chris Dillow brings out and which others are also noticing and calling to attention. While conditions may have changed since the time of Marx, class structure and power structure persists. Out of paradigm headline at Housing Wire here. Fannie Mae is paying the U.S. Department of Treasury $7.2 billion, bringing its total dividend payments now to a level exceeding the total bailout it received. “Obviously, it’s good news for taxpayers that Fannie Mae is profitable,” Chief Executive Officer Timothy Mayopoulos said during the earnings conference call.Fannie Mae will have paid the Treasury $121.1 billion when this dividend payment is made. Since 2008, Fannie received $116.1 billion in government bailouts. the federal government counts the money from quarterly profits as dividends instead of as a repayment of the bailout. So the way the government currently arranges the operations of these nationalized housing GSEs is another act that foments the smaller deficit we have seen over the last year. These GSE operations coupled with the actions of the Fed to return interest it receives on both the US Treasury securities as well as the GSE bonds it is factoring has greatly contributed to what we can see ex post as a reduction in the federal deficit. Its in many ways a "new world" post 2008 as far as evaluating fiscal policy. If U.S. antitrust enforcers decide to challenge the proposed $45 billion merger of Comcast Corp and Time Warner Cable Inc, it may be because of an idea with a funny-sounding name that has been gaining currency in government offices. A monopoly is one seller with many buyers, while a monopsony (pronounced muh-NOP-suh-nee) is one buyer with many sellers. A textbook example is a milk processor that is the only option for dairy farmers to sell to, and that then forces farmers to sell for less. Federal Reserve policy makers were repeatedly caught by surprise as the economy and financial markets collapsed around them in 2008, according to newly released transcripts of their meetings from that year. If you believe, for some reason, that the Fed has special fortune-telling abilities, these records should disabuse you of that notion pretty quickly. Repeatedly throughout that crisis year, the Fed took relatively hopeful views of the economy's fate, only to play catch-up when the situation got much worse than they expected, sometimes in a matter of just weeks or days. To be fair to the Fed, the unfolding economic collapse took a lot of people by surprise. And the Fed did act fairly aggressively when it got around to acting. But these records are reminders that the human beings pulling the strings of the world's largest economy are no better than most other economists at predicting the future. Janet Yellen comes out looking pretty good, well, among the best of a bad bunch, anyway. Fred Mishkin got it, too. But they didn't know what to do. 3 days left to sign up for my next Forex class. Learn to use MMT to profit in the currency markets! 3-days left until my next Forex course! Market Composition -- find out how to get the scoop on what other market participants are doing in the market. It's like knowing the cards of other players in a poker game. MMT--Yes, this is the only APPLIED MMT course you will find anywhere. It's great to talk and theorize about MMT, but I teach you how to use MMT to trade the markets and MAKE MONEY! Put MMT to work for you! Mental Game -- This is by far the most important ingredient to trading success. If your mental game is not correct, if you don't have the psychological traits that ensure success, then it doesn't matter what system or method you use, YOU WILL LOSE. On the other hand with the right mental game you can literally throw darts at a dartboard and MAKE MONEY! I give you exercises, tricks and rules that ensure you have the proper mental game to succeed. The trading account that I trade for this course, using these principles, is up 90% in 9 months with ZERO losses! You can have results like that, too. In fact, many of my former students are already trading and making money. Check out the testimonials. Learn to trade Forex. The biggest, most liquid markets in the world. No commissions. 24-hour action. Broad-based trends. And use the power of MMT to earn big profits. Yanis Varoufakis — Can the Internet democratise capitalism? Technological fixes to time-honoured problems are all the rage these days. Bitcoin is meant to fix money, social media are seen as an antidote to Rupert Murdoch and assorted tyrants, networked robots are to help countries like Japan deal with demographic declines etc. Perhaps the largest claim is that the Internet has helped (or is about to help) democratise capitalism. Ten years ago that claim struck me as both fascinating and dubious. So, I sat down and wrote an article about it (circa 2004). Its gist: The Internet is a wonderful leveller. But democracy requires a great deal more than mere ‘levelling’. Capitalism and democracy are antithetical. There is no "democratizing capitalism." Capitalism is inherently oligarchical, and modern "democracies" are republics through which an established power structure functions. Democratizing capitalism is either some from of socialism, either public or worker ownership of the means of production, or a mixed economy that is not controlled by the rich and powerful. ....The plutocrats had had their opportunity, and they had blown it [just prior to the Great Depression]. America had given them everything they desired. The freedom to do whatever they wanted. The power to bend others to their will. And ever-grander fortunes as both incentive and reward. Americ choked on those fortunes. A maldistribution of income and wealth that severe the American economy simply could not swallow. Quoted in Sam Pizzigati, The Rich Don’t Always Win: The Forgotten Triumph over Plutocracy that Created the American Middle Class, 1900-1970. Democratic strategist Joe Trippi: There Will be a Libertarian President. And Sooner Than You Think. I think it is safe to say that investor activity in the housing market has changed the face of real estate buying. Back when the crisis hit in 2007, some analysts were cheerleading the hedge fund crowd as a tiny blip in the market. It is hard to call it a blip when 30 to 40 percent of all purchases are going to investors for close to half a decade. A recent analysis from RealtyTrac found that the estimated monthly home payment for a regular three bedroom home (costs include mortgage, insurance, taxes, maintenance, and subtracting the income tax benefit) rose an average of 21 percent from a year ago in 325 US counties. What about household incomes? That is another story. So it is no surprise that we are largely becoming a nation of renters. It is also no shocker that young households are largely unable to begin household formation via buying a home. Many are living with parents well into “young” adulthood. For the first time in history, we had a six year stretch where we added more renter households than that of actual homeowners. Many details in this post. A principle feature of The American Dream is owing one's own home. That possibility is becoming more and more remote for more and more people. If this crystallizes, it is going to change American culture in ways that cannot be foreseen. But it is quite foreseeable that the consequences will be profound socially, politically and economically. Hey Democrats, Please Stop Talking about the "Trust Funds"
With the good news that the Obama administration is dropping its proposal to cut Social Security through chained CPI, I figured it would be a good time to do a refresher on how Social Security actually works. Although right-wingers probably want to destroy SS, I sometimes come across Democrats making false statements too. The worst, and most common error is thinking that there are "Social Security and Medicare Trust Funds." As innocent as this mistake may be, I cringe every time I hear it. Sorry folks, but these Trust Funds aren't real. They exist only in a legal/accounting sense, but not in any real economic way. Unfortunately, many Americans hold views that range from thinking SS&M are not part of the government, to thinking that SS&M are funded from payroll taxes and the Trust Funds. Neither are true. Higher tax receipts and lower deficits, i.e. lower savings, on the way. Both leakages, this policy substituting one leakage for another. Economic activity to be unchanged. Story here from CNN Money via Yahoo. Bad news for American families is great news for the financial industry, according to the real estate finance industry trade magazine CRE Finance World (CREFW). Workers’ incomes will continue to decline and homeownership will become an ever more remote dream for the typical American, boosting demand for rental housing and pushing the cost of rent up, an article in the magazine’s new edition says. That will cause the market for rental housing securities — complex financial contracts backed by rental properties — to explode over the next year, Deutsche Bank analyst Harris Trifon writes. First, securitize the mortgages, then foreclose, then securitize the rents. What could go wrong? Pete Peterson is right at the top of the list. Next week is going to be brutal [over two-thirds of the US]. Alaska and the West Coast way above normal as jet stream shifts. ... the longer-term outcome may be—and I want to emphasize this, because nobody in the United States seems to want to pay attention to it—the outcome may be the construction, the emergence of a new Cold War divide between West and East, not this time, as it was for our generation, in faraway Berlin, but right on the borders of Russia, right through the heart of Slavic civilization. And if that happens, if that’s the new Cold War divide, it’s permanent instability and permanent potential for real war for decades to come. That’s what’s at stake. Peter Radford — Adam Smith – Socialist?